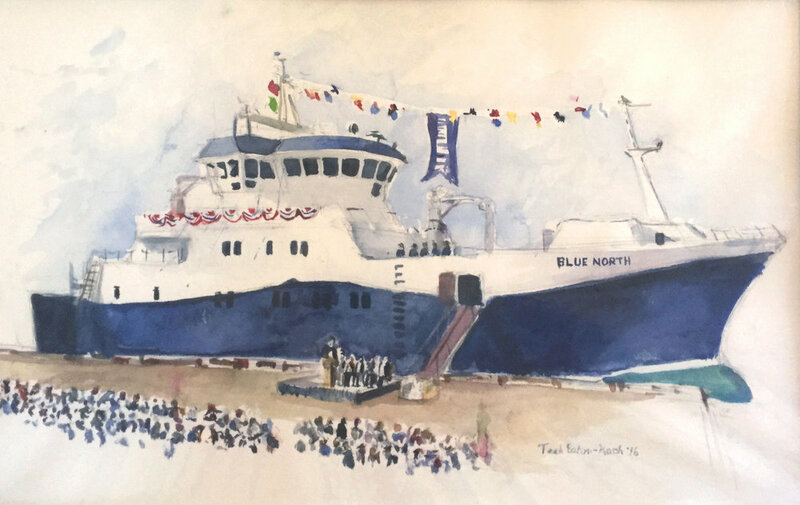 Blue North Industries of Seattle, WA hired Teek to paint a large fine art commission of their new state-of-the-art fishing vessel F/V Blue North. 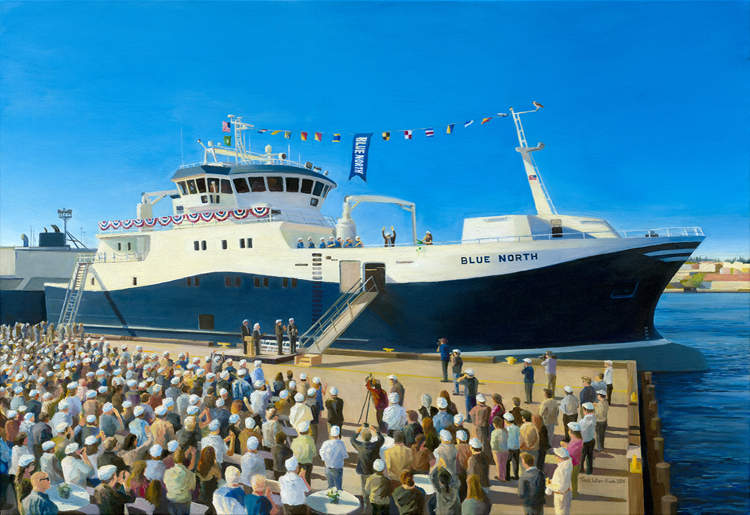 The christening ceremony was held in September 2016 at Fisherman's Terminal. Teek was contracted to attend the ceremony, produce a series of on-site sketches, and produce a large scale painting upon return to his studio. At the request of the client, Teek was positioned on a construction lift that was raised above the assembled crowd. This vantage point gave Teek a great view to illustrate the entire ceremony. A watercolor sketch was completed on site during the ceremony and used as a guide for the formal painting. Following client review and approval, Teek drafted a full size pencil sketch and transferred it to a professional grade 30" x 40" stretched canvas. When starting on the final canvas, a underpainting layer of naples yellow was added first before other colors. This would allow the sides of the boat in the finished painting to "glow" as if by the sunlight. Next, additional layers of paint were diligently and carefully added all while ensuring the lines and perspective of the Blue North remained true. Certain liberties were taken to make sure the viewer's focus was on the vessel. Also, specific people were added to the painting including the President and co-workers at Blue North Industries. The finished painting was reviewed by the client, approved, and then shipped out to Seattle.